I'm trying to inject a bit more humor in my scrapbook so it will be fun to read. This layout didn't take long at all and it made me smile while I was doing it. 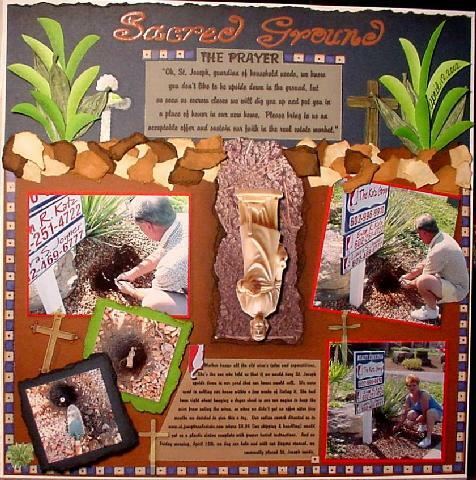 I used cardstock to tear a hole in the ground, chalked the edges, placed a printed "dirt" paper behind, and "buried" the cropped photograph of our St. Joseph statue upside down in the hole using pop dots. Then I tore some gravel pieces, using various colors of cardstock, chalked them, and laid them on top of the ground. I used some 2-sided green stock to create the spikey plants, chalked the spikes for depth, threw in a bit of twistel for interest and glued them on making a "frame" for the prayer. Title was embossed using copper powder and journaling was on vellum. I threw in a few cross stickers to emphasize the theme, and bordered the page with a sticker border. Then I said a little prayer and placed the finished page into my scrapbook!